We originally missed this one, but not for a lack of trying. It simply didn't open anywhere. Not anywhere outside NYC and Los Angeles, that is. 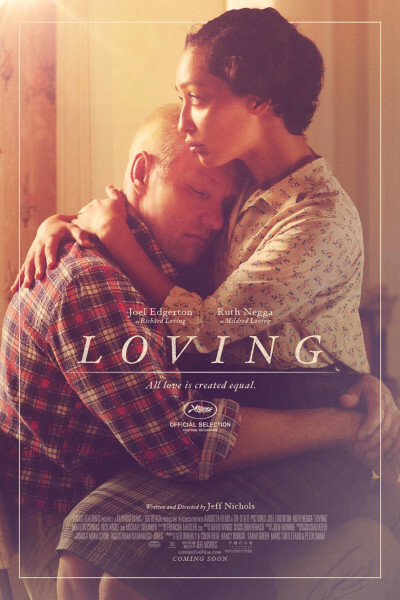 Now that Ruth Negga is nominated for an Oscar, however, Loving has been re-released in a few more theaters. It's an interesting film, one that I enjoyed and did not enjoy in equal measure. It's well done, by most accounts. At times, it attempts to be Terrence Malick's Days of Heaven, using the golden hour to cast warm light on what one lawyer describes as "an odious reality." Another scene, in which the husband reveals the acre upon which he will build his wife's home, is virtually word for word identical to Matthew McConaughey's Gold. And there are several moments that seem to ignite Mississippi Burning's coming violence, but they evaporate before they combust. All this to say, what makes Loving enjoyable and unenjoyable is its unconventionality. I love that it is so earnest, so sincere, so quiet, so still, so empty, like a meadow in Montana. And I respect that it does not put on the usual show, dragging us through cinematic tropes we've seen dozens of times before. There is no name calling, no harassment, no threats, no crosses in yards, no bricks through windows, no shotguns, no menacing citizenry, no mobs, no great protest, protestation or pivotal exchange of any kind. Instead, we get restrained minimalism. Innuendo. One small minded cop and a very literal judge who utter perhaps fifty stoic words between them, and none of the usual variety. They are enforcing the law as it appears on the books in The Commonwealth of Virginia, period. Most abundantly, Loving is simply truth in advertising, focusing almost exclusively on the love between a husband, his wife, and their three beautiful children...making Loving a largely internal affair, and one haunting character study. There's no ebullient climax preceded by three typical acts of innocence, innocence lost, and triumphant overcoming. Sure, we get lite pencil sketches to that effect, and a watershed U.S. Supreme Court ruling that occurs off-camera, but it comes as an afterthoughty whisper, primarily conveyed through text on three final screens. But I also felt—throughout and at the end—that something was missing. It's a bit like eating celery or one Triscuit. Good, to be sure, but hardly enough, and by no means satisfying. I suppose that's the point, and one not lost on this viewer. The title is not War, or Battle, or Civil Rights, or X. It's called Loving. But I did hanker for more, and wished it had more meat or cinematic moments. More emotion. More compelling something-or-other. I can see now why it didn't open wide: not because it's too "niche-y," or too actorly, or too artsy, or too much. No, I think it didn't open wide, or at least e x p a n d because, in part, as much as it's Loving, it's also Boring. And that, my friends, is a stone cold killer. A death knell at any box office, whether in NYC or Los Angeles. People don't mind character studies, in fact, they lap them up. But only if they're captivating, compelling, hypnotic, mesmerizing, addictive. Challenge me, accuse me, doubt me, harangue me. But don't bore Dear Viewer or give him a headache. Both are, historically, on-the-box recipes for box office poison.